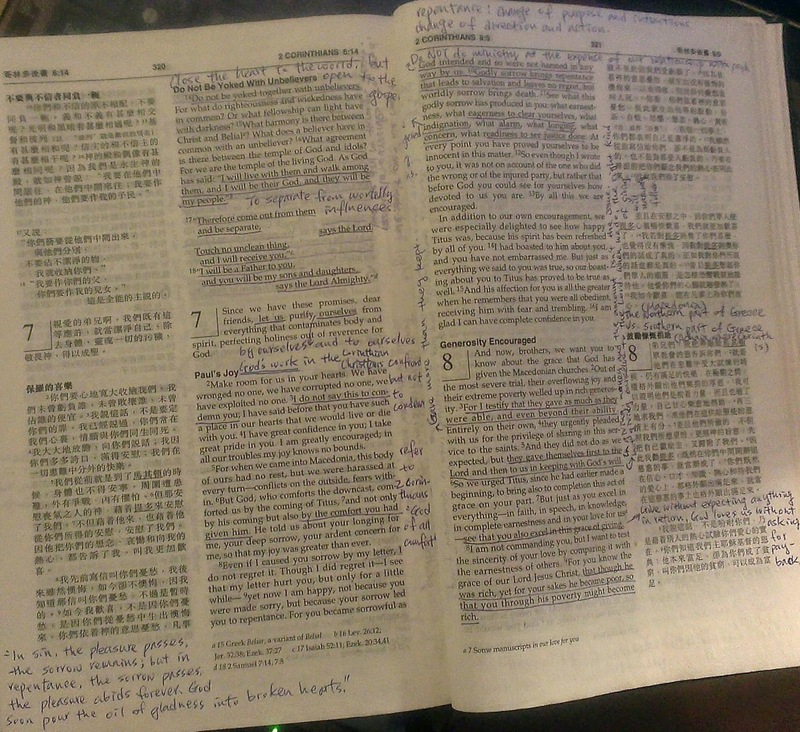 Notes I made on my Bible from my personal Bible study. When I just became a Christian 12, 13 years ago, my Catholic friend gave me his precious Catholic Chinese version Bible as a gift. The Bible was precious to him not only because it was blessed personally by a Cardinal he respected, but also because he was saved by the faith that the words of the book transpired. For the fact that the first thing my friend gave me wasn’t a beautiful cross or a statue of Saint Mary but this red cover freaking thick book, it showed me that this book must have some kind of tight connection with this faith that I now professed. Therefore, to know what I got myself into, I must read this book. It took me quite a while to read through the whole book. My friend wasn’t too happy when he found the book in my bathroom. Well, but at that time, it really was the only free time I had doing my business in the bathroom, and I was eager to read through the whole book. My personal reflection on the Bible after reading it for the first time – it was a weird book with weird stories! I was intimidated by the angry God in the Old Testament to a point that I never read the Bible again for a very long time. I wanted nothing to do with that brutal unforgiving God. I wanted a god who would just listen to my prayers and give me everything I prayed for. The second time that I ever picked up the Bible was 5, 6 years later. I didn’t really know the difference between Catholic and Protestant, but I had more “Christian” influence at that time that reconnected me to God. This time it wasn’t only the faith that I wanted to know about, but it was God Himself whom I wanted to get to know. How could my Christian friends be worshiping and praising and loving God the way they did if God was really such a brutal unforgiving God? I must have missed something when I read through the Bible the first time! This time when I picked up the NIV/CUV bilingual Bible that I bought, I didn’t quickly read through it. Since the Old Testament was too hard for me to grasp, I started with the New Testament. I developed the habit of looking up online for information whenever I encountered verses that I could not understand, which was, actually, quite a lot of the verses. Especially for books like Romans, First and Second Corinthians, Ephesians...etc., who the hell knew what the author was talking about!!! (I didn’t know they were written by Paul at that time.) But I took my time to do the researches. During this time, I discovered a few websites with good commentaries on the entire Bible. Since there were so many websites that talked about the Bible, and any John Doe could blog his opinion on the Bible, how did I know which websites were more accurate than the others? Well, other than looking up for information online, I also developed the habit of careful examination of the information I found online by checking them against the scripture itself and its broader context. It was, to be honest, quite a lot of work. I did all these when I worked full-time as website programmer. The only time that I could use to do all these was the few hours before going to bed, but I felt that it was a natural thing to do to be a responsible Christian. From my personal Bible study and researches, I began to see more clearly of who God really is. He is loving and merciful, but at the same time, He despises sin, and He just isn’t the Santa Claus god that I envisioned Him to be. He is eager to be in relationship with His children, and we the Christians are His children! I began to know a little better of God’s heart, and with this knowledge my relationship with God began to grow. I miss that period of time in my life, when I was simply immersed in the knowledge of God with the words of the Bible. Christians and their Bible – that’s what I thought it must be for Christians. That’s why I was so shocked when I realized that so MANY people who claim to be Christians don’t take the Bible seriously. Some of them don’t even read the Bible. And for the few that read the Bible, they rely SOLELY on their Pastors, Sunday school teachers, and Bible study leaders to tell them what to believe or do without using their own brains. Just having a Bible in your living room won’t help you know God. The Bible is NOT an ultimate spell manual, reading through it without understanding won’t help you grow spiritually. If you rely solely on the teaching of your leaders without your own discernment, how do you own your faith, and how could you tell if these people are telling you the truth? How could you say that you love God, but refuse to take the step to get to know Him through the words that He wrote you and preserved for you? If you are convinced that evangelism is the responsibility of a Christian, how could you not taking the responsibility to know better of what is that you are sharing about? If you are a Christian, how could the Word not be a part of your life? Don’t just SOUND like a Christian, don’t just TALK all Christian, anyone knows a few Christian catchwords. Be a Christian starting from reading your freaking Bible!